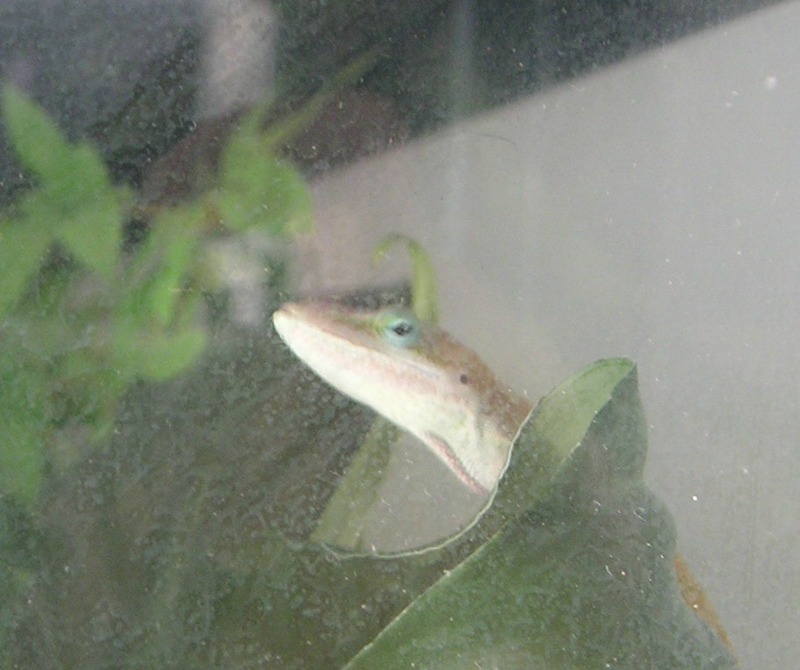 This entry was posted in Grade 4 and tagged anoles, critter corner, plants, Reinemann. Bookmark the permalink. Thank you for writing about the critter corner. I must admit that I have seen the tank in the hallway, but never knew that there were three animals living inside. It was very helpful to have a photo of the anoles. Not just because that is proof that they are in the tank, but because I now know what they are. Sam knows a lot about animals, so it would not surprise me if he already knew about these. Keep up the good team work, and sharing your writing with the world! Great article on the Critter Corner. 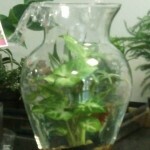 Jenna, I know you have seen anoles and air ferns when you visit us in Florida. When you come the next time we can catch a few and you can take them back to the Critter Corner to share with everyone. Amazing article very informative I thought you did a great job.I never noticed the Critter corner before, I will be sure to check next time I come by. I enjoyed reading your post about the Critter Corner. The anoles are a challenge to see, aren’t they?! 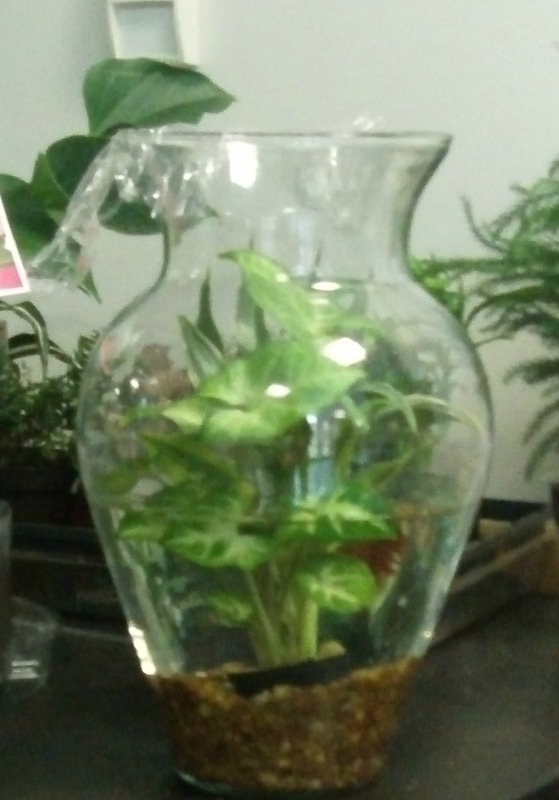 For the longest time I thought the small one had escaped, but I saw it the other day. Phew! 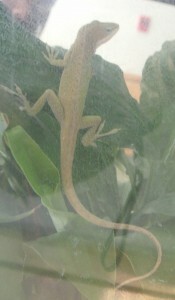 Did you hear that one of the large anoles escaped a few weeks ago? Thankfully, it stayed close to the tank by the warming lamp. Dr. Reinemann, Mr. Tom and I tried to catch it, but it ran up the wall to the ceiling. 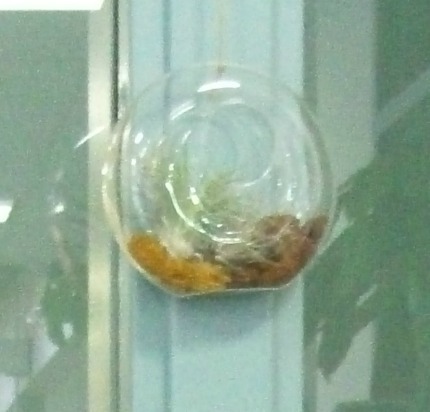 I covered it with a box and tried to gently bring it down to where we could easily grab it, but it got out at the last minute and almost jumped on my head. Yikes! Brave Mr. Tom climbed on the table (please don’t try that!) and was able to catch the runaway lizard with a red cup. 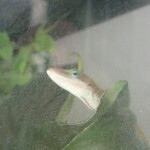 I think the anole was very happy to be safe and sound inside his tank! Thanks again for reporting on the Critter Corner! You did a nice job of describing it so that people who aren’t at Chickering can get a clear picture in their minds of what it is like.